Great blog as usual Ryan. You pointed out one fundamental problem with the 1004MC Market Conditions Addendum (required in most appraisals for lending). It looks at a very small window of time, too small to recognize if trends are seasonal or not. I agree Gary, if we are going to look at the past 12 months we should also include a 5 year trend to see some context. Thanks Gary. Good point on the 1004MC. The seasonal market is very powerful, and it takes intent to know how it works and to see it in action. It seems it looks slightly different each year, but generally the same. This is a simple tip but so helpful for those looking at trends. It is important to know how to look at the data. Thank you Tom. This is a very simply tip indeed, though it is often neglected. Looking at the same month last year is very telling, and it’s something we ought to consider doing every single month (but especially during the strongest seasonal months). I have seen multiple articles on the national and local level compare December with January, and it’s unfortunate. This is why it’s so important to know how numbers ought to be compared so we can quickly sniff out when something is not correct in an article or something we (or clients) see online. 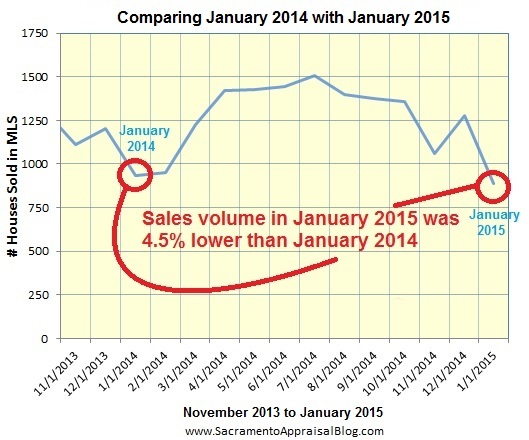 Likewise, when March data comes along, it will look amazing compared with the lower sales volume of January and February. This will be good news for real estate, but what we really need to do is look at March 2014 and compare it to this month. Better yet, we can take a quarter’s worth of data in Q1-2014 with Q1-2015 to see how the market is similar and different.